Cook ground beef with canola oil until the color changes and then stir in onions. Saute for 4-5 minutes over medium heat. Add tomatoes, tomato sauce and tomato paste, garlic, sugar and salt to taste. Cook for about 15 minutes over low heat until the mixture thickens. Stir in the spice and let it cool. Boil lasagna noodles in lightly salty water according to the directions on the package. Rinse under cold water and drain. Preheat the oven to 375 F (190 C). Pour one ladle tomato mixture over a lasagna pan, spread evenly and arrange a layer of boiled lasagna noodles (usually 3 pieces side by side). Then, spread a ladle of tomato sauce over lasagna and spread some ricotta cheese to cover all over. Continue layering with the same order; lasagna, tomato sauce, ricotta cheese and lasagna until using the all lasagna. You can either leave some tomato sauce for the top or use it all in between the layers. After layering is done, use all the mozzarella and parmesan cheese to cover the top of lasagna. Cover the top with aluminum foil and bake for 35-45 minutes. You may remove the aluminum foil and broil the top at the last 5 minutes. Let it rest for 10-15 minutes, slice in squares and serve hot/warm. Kiymayi ve kanola yagini bir tavaya alin ve kiymanin rengi degisene dek pisirin. Sogani ilave edin ve orta ateste 4-5 dakika sote edin. Domates sosu, rendelenmis domates, domates puresi, sarimsak, seker ve tuzu ilave edin. Yaklasik 15 dakika kadar sos koyulasan dek kisik ateste pisirin. Italyan baharat karisimi ilave edin ve sogumaya birakin. Lazanyayi ambalajin uzerindeki tarife gore hafif tuzlu suda haslayin, soguk su altina tutun ve suzun. Firini 190 C (375 F)’ye isitin. Lazanya tepsisinin dibine bir kepce domates sosundan yayin. Uzerine bir sira lazanya yayin (genelde 3 parca yanyana oluyor). Sonra, bir kepce domates sosunu uzerine yayin ve yuzeyini kaplayacak kadar lor/ricotta peyniri ile kaplayin. Ayni sira ile; lazanya, domates sosu, ricotta/lor peyniri ve lazanya olacak sekilde siralayarak geri kalan malzemeyi kullanin. Domates sosundan bir miktar uzerine koymak icin ayirabilir ya da hepsini ic malzeme olarak kullanabilirsiniz. Son olarak, rendelenmis kasar peyniri/mozzarella ve parmesan peynirini uzerine esit olarak yayin. Aluminyum folyo ile kaplayin ve yaklasik 35-45 dakika kadar pisirin. Arzu ederseniz firindan cikarmadan 5 dakika once, aluminyum folyoyu alip lazanyanin uzerini kizartabilirsiniz. Servis etmeden once 10-15 dakika dinlendirin, dilimleyin ve sicak/ilik servis edin. 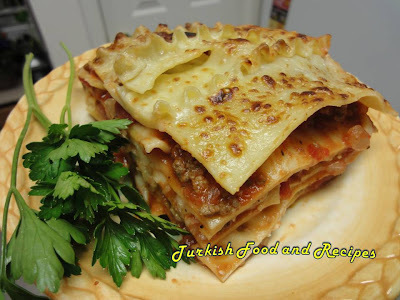 Delicious looking lasagna! I love the way you were able to get the cheese on top so toasty brown. Hand me a fork! Like seeing when you go to other recipes. Looks great!